NETWORK FINALS: NBC’s shows shuffled a tenth in final numbers, with AMERICA’S GOT TALENT up and BETTER LATE THAN NEVER down. CABLE HIGHLIGHTS: There were two high-profile arrivals on cable Tuesday night. After the 0.90 season finale of THE HAVES AND HAVE NOTS (up a tenth from last week), OWN debuted QUEEN SUGAR, which held a very solid 0.68 (and retained most of that audience on Wednesday without a lead-in, scoring 0.61 for its 2d episode). Meanwhile, FX premiered ATLANTA with back-to-back episodes at 0.53/0.48, a strong retention into the 2d episode that suggests word of mouth should be in its favor. ATLANTA skewed far younger than QUEEN SUGAR: although they were only 0.15 apart in 18-49s, QUEEN swallowed ATLANTA in the 50+ demo, 1.51 vs. 0.25. Elsewhere, Discovery’s miniseries HARLEY AND THE DAVIDSONS performed well for the network at 0.85. On USA, WWE SMACKDOWN dropped 0.12 from last week to 0.79, and CHRISLEY KNOWS BEST was down 0.04 to 0.66. Bravo’s BELOW DECK returned at 0.55. On Spike, INK MASTER rose 0.05 to 0.55, and the REDEMPTION after-show was down 0.05 to 0.30. 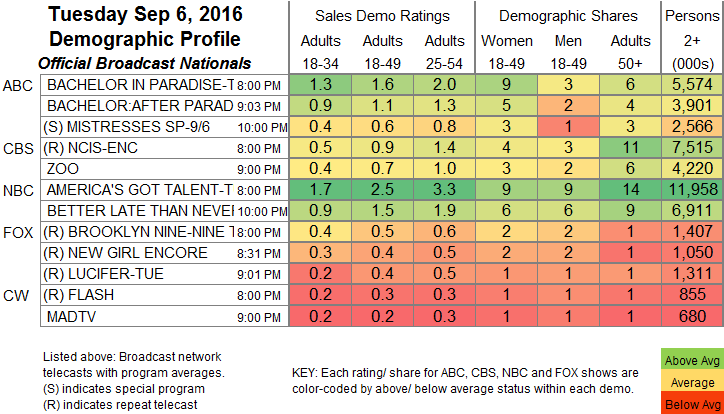 A&E’s MARRIED AT FIRST SIGHT gained 0.04 to 0.47, and BORN THIS WAY fell 0.08 to 0.23. On HGTV, HOUSE HUNTERS INTL was at 0.41, with HOUSE HUNTERS at 0.40. History’s FORGED IN FIRE slipped 0.03 to 0.38, and MILWAUKEE BLACKSMITH was at 0.22/0.20 compared to last week’s 0.25/0.22. Lifetime’s DANCE MOMS returned at 0.38, after a lead-in special at 0.24. On Food Network, CHOPPED TEENS rose 0.07 to 0.36, and CHOPPED JR was up a tenth to 0.34. The season finale of HBO’s HARD KNOCKS was up 0.04 to 0.34. A trio of ID shows were closely packed, with 2 episodes of CRY WOLFE at 0.29/0.28, and SWAMP MURDERS at 0.27. TLC’s COUNTING ON dropped 0.06 to 0.26, while CAKE BOSS ticked up to 0.18. 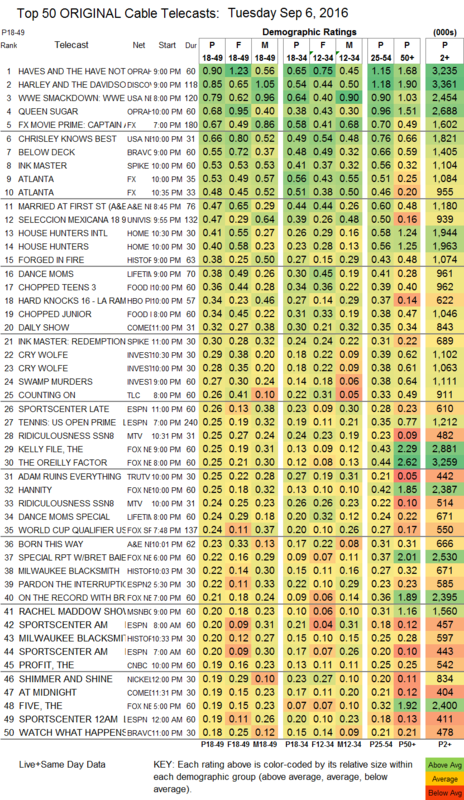 MTV’s RIDICULOUSNESS was at 0.25/0.24, compared to last week’s 0.30/0.26. AMC’s HALT AND CATCH FIRE lost a tick to 0.13.